I’ve never considered myself to be much of a cook. The truth is that I cannot even make tea or instant noodles forget abrosia. However, eating out or ordering in every day gets boring and frankly the food stuff that I get at reasonable prices is flat to taste. You can imagine what kind of chinese food an Udipi joint will produce! So, whenever time permits I have been forced to personally seduce my taste buddies. These instances have admittedly been rare and given the fact that I am quite finicky when it comes to food my choices are limited. In hindsight however, I guess what works for me is the process of making the damn food and not the act of stuffing it in. Calories are calories after all. So I’ve been approaching my culinary acts not as a hobby or as something I need to learn but more as a challenge and adventure. 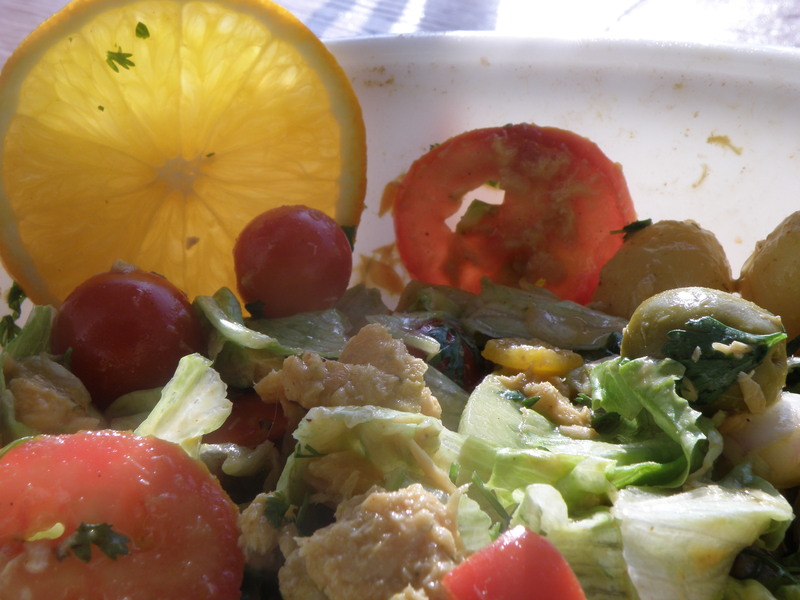 Given who I am and what I am, the presentation of the food is sometimes more important to me than its taste. Luckily whatever I have made so far has tasted ok, but I would rather bet on IFCI getting a banking license than my coming up with a finger licking creation. So I try to be a little creative and therefore keep needing ingredients that are not so commonly found at least in the part of Hyderabad that I live in. 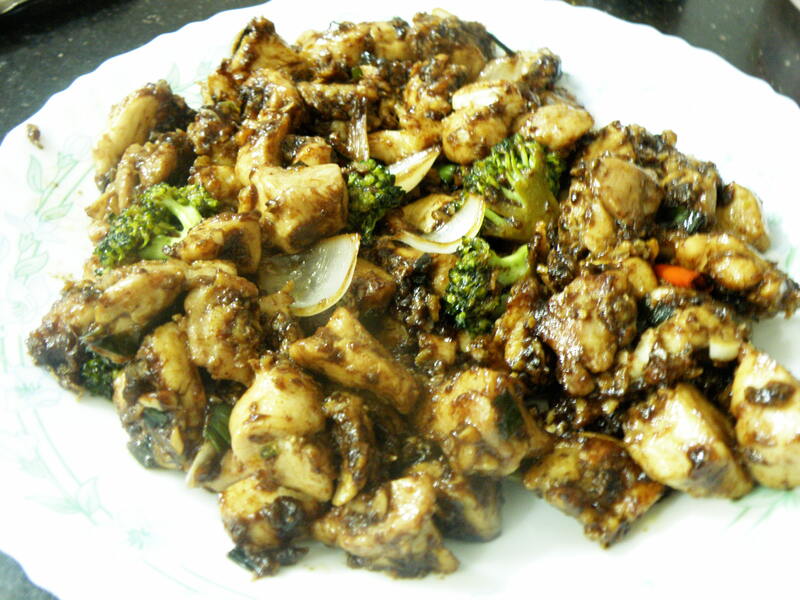 The main course – stir fried chicken. I relate to stir fry cooking. It’s all about speed and I love speed. If you give me a hundred shots and a challenging time limit, I might fire away all of the shots and probably hit the target on equal if not more occassions than someone who might take his time aim and shoot carefully and accurately but save bullets. In a world of scarce resources and if one takes count of inventory as well, then I’ll lose. But if the end is all important and not the process to reach it, then count me in. Endless hours of baking or stirring or marinating is not me. 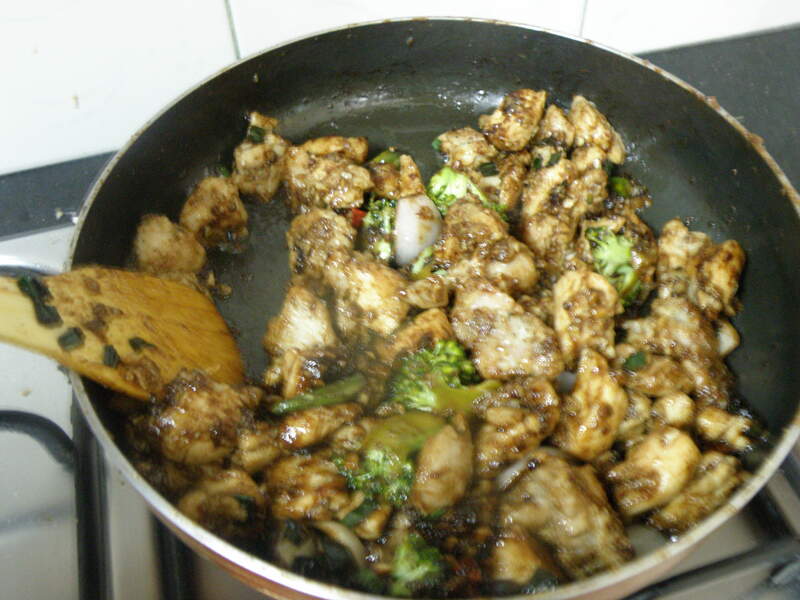 Also, when you stir fry, you have a very short time to get it right since its done over a hot flame. the first pic is about the process – its not come out good, I know. Cooking stir fry over a hot flame with one hand and negotiating the Olympus SP-570UZ (weight = 455 grams ex batteries and memory card!) in the other is not exactly easy! Finally, the dessert – strawcolate. Well, not really a dessert but perhaps it comes close. 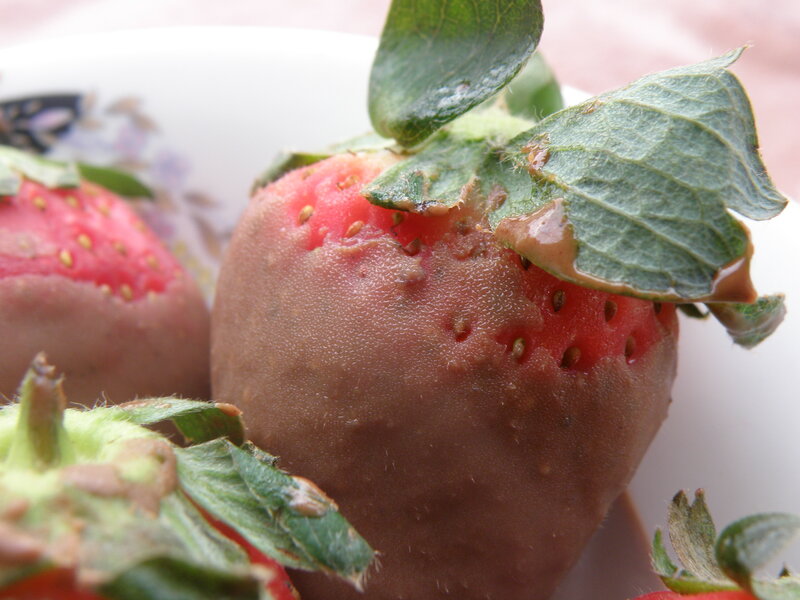 Theres something quite divine about the compliment of sour and sweet which came out rather well when I coated these plump strawberries in chocolate and froze them to a contradictory death. That was it. I guess it was a self created treat that Mr. Market allowed me to indulge in given the way he has been perking up these days. Hell, even the metal counters have started gleaming. Here’s to more such epicurian menus and euphoric markets. I know, white wine was missing. though i’m a veggie but still both the dishes especially the dessert looks yummuy…!! thinking of coming over to ur place on the weekend… address ?? I guess you meant “ambrosia”..
the stir fry and strawberry dessert look yumm !! !